Lately when you look at the IAPLC entries there is a style of aquascaping that seems to prevail over the others. While most of us came in to the hobby after seeing Takashi Amano's impressive Nature aquariums, we are now seeing the rise of another style of aquascape. First things first, I know this topic is a bit divisive amongst hobbyists. Some don't agree with aquascaping styles at all, and that the artist should not be bounded by styles and rules. First let's understand the concept of an aquascaping style and this is my personal opinion so feel free to disagree. What makes a style, a style? Someone creates a type of aquascape that no one has seen before. That in itself does not make it a style, it actually makes it a breaking of the rules of the current trend of existing styles. However if he is successful enough in inspiring other people to follow in his footsteps and try and replicate his work, then a trend will emerge with its own traits or rules that define and highlights its differences to other styles. Have enough people doing it and a new style of scaping is born. I don't believe anyone thought about creating a style from the get go. One could argue Takashi Amano with his nature aquarium . But when he started doing his aquariums, he probably wasn't thinking about creating a style, success and the fact that people followed him, turned the Nature aquarium into one. I believe in styles, not as a way to shackle creativity, on the contrary, the true great aquascapers are the ones that break the rules and help the hobby develop in new creative ways, thus creating new styles. But when you put a Nature Aquarium next to a Dutch aquascape it's easy to see that they are different and that both have a set of design rules and characteristics that allow us to identify them for what they are. The Diorama aquascape is in my opinion something that started as evolution of the Nature aquarium, its more hardscape intensive and scale plays a big role in their design. While in the Nature aquarium you are only trying to replicate nature, in a diorama you are taking it a bit further. You are trying to replicate a specific scenery or landscape. Artistically these aquariums are planned to the smallest detail, larger stones are placed at the front, smaller ones at the back to enhance the sense of depth and scale. Substrate tends to be dramatically banked up on the sides to help with this, while at middle the creation of detailed pathways or ridge lines guide the eyes into the horizon far away. DIY plays a big part in designing them, breaking rocks, using various methods to glue them into shape, creating trees out of mere twigs, a lot of work goes into design. Plant wise there is also great care, mosses are used to enhance the aged look of the hardscape design. large leafed plants are used at the front and smaller at the back, overall they tend to not be planted very heavily. Light and shadow also plays a big part, the large intricate hardscapes are designed with this in mind, enhancing some areas while shadowing others, this leads to a high visual impact aquascape. There are a lot of threads online discussing the rise of the Diorama aquariums and why they seem to be so successful in contests like the IAPLC. To me that high impact is the reason. An elaborate detailed hardscape like Takayuki Fukada's 2015/16 winning works have a high visual impact from day one, the canvas is already impressive, the plants are just the lick of paint that adds colour to it. 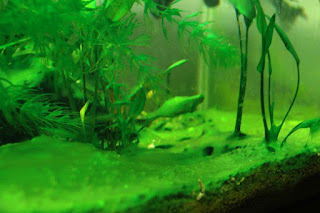 While a traditional Nature aquarium as a lot more variables, the plants will have to grow, and the hobbyist has to have the skill to make them grow into a design that will be impressive. I am not saying that there is no skill in designing these impressive hardscapes, there is a great amount of skill, just because you can glue some wood and rocks together doesn't mean it will be something beautiful. But, if you can create something impressive, than it will be so from the start. Not only that but the heavy use of mosses and minimal plant mass, makes these Dioramas easier to keep which decreases the risk of failure. What started as a natural evolution of the Nature aquarium has evolved into its own style. 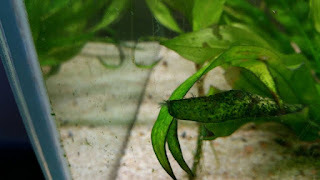 One that has found its niche amongst the competitive aquascapers that every year submit their scapes to contests. We could almost say its a style perfected by their drive to be competitive, to do better then their peers year after year.